2013 has been a very giving year – so far – from the stock markets both here and throughout the world. 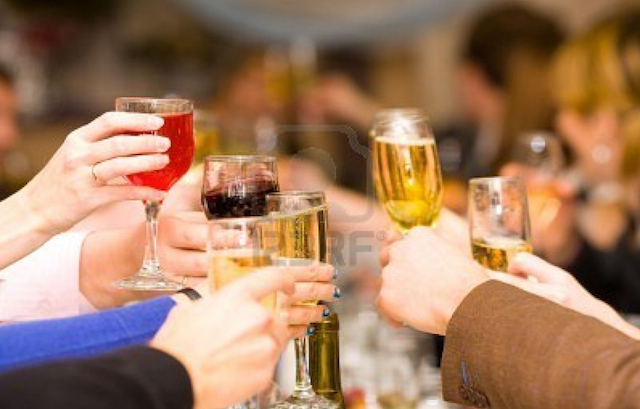 Today on Friday January 11th, the S&P 500 closed at 1,472 – a new 5 year closing high for the USA stock markets. We had predicted a sharp move higher in the USA stock markets in our last article on December 30th once an agreement on the Fiscal Cliff was reached and this turned out to be the case. For the month of December, most of the rest of the world markets were going higher and leaving the USA markets behind as the unresolved Fiscal Cliff weighed heavily on the USA markets. Once the Fiscal Cliff was resolved it appears that people felt much more confident in investing in stocks. Initial reports of mutual fund inflows showed that this week had the largest mutual fund inflows of cash in nearly four years. Could this be a signal that the individual investors are returning once again to the stock market? This current bull market began on March 9, 2009 with the S&P 500 at 666 (yes 666!). With today’s close at 1,472, the S&P 500 is now higher by 117% from it’s financial crises lows of 666 in March of 2009. This 117% gain is the 8th highest bull market gain in the history of the S&P 500. 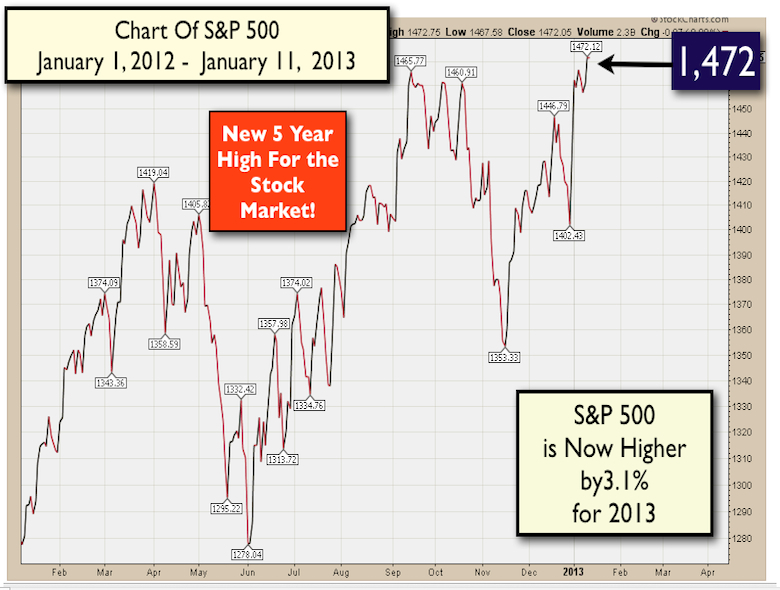 The S&P 500 is now higher by 3.1% for the first 11 days of January, 2013. Below is a chart of the S&P 500 for the past year. With a backdrop of an economy that continues to grow at a moderate pace along with all time low interest rates from the Federal Reserve, the USA markets are positioned to continue to move higher through the first three months of 2013. However, near term the markets are very overbought and we would caution readers about chasing the markets at these 5 year highs. What do you get when you combine the worst plunge in housing prices in history with an all time record lows in interest rates? Answer is the most affordable time in decades for people to purchase a new home. To show how housing is at its most affordable now, we are enclosing a chart of the Housing Affordability Index. The Housing Affordability Index measures the affordability of residential real estate. The Index measures the degree to which a typical family can afford the monthly mortgage payments on a typical home. 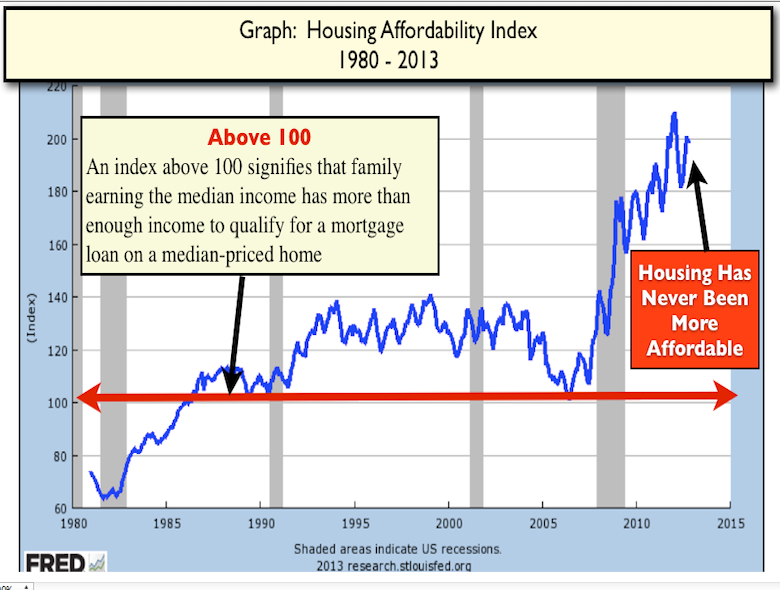 Below is a chart of the Housing Affordability Index for the past 30 years. To easily understand the Housing Affordability Chart – 100 is average affordability – below 100 is homes are less affordable – above 100 means homes are more affordable. The higher above 100, the more affordable homes are. Today the home affordability index is at 200 – A quick glance at this 30 year chart shows that homes have never been as affordable as they are now. So if buying a home makes sense for your financial situation then you have never had a better purchasing opportunity for a home than right now. Thank goodness the on-going Fiscal Cliff drama was resolved though most of the resolution consisted of again kicking the can down the road. We would like to alert readers to the next fiscal crises that must be addressed by our dysfunctional government. That will be the debt ceiling crises that will start to emerge into the public consciousness in 5-7 weeks from now. We try to keep the politics out of these market commentaries. However when the national politics become the primary drivers of the stock markets direction then we must factor their impact on current asset allocations and also in forecasting the future directions of the markets. Remember the August, 2011 – October 2011 period where the stock markets sank 20% on the Congressional Debt Ceiling debacle as a reason why it is necessary to keep an eye on Washington DC for the health of our portfolios. With markets at five year highs along with the current technically overbought conditions of the markets we urge caution to people who are thinking of putting fresh money to work at this moment in time.